Five Common Misunderstandings About Filing Bankruptcy - Johnny W. Thomas Law Office, P.C. Often, when we hear the word bankruptcy, we tremble in our cowboy boots! (Hey, we are from Texas!) The truth is, most people are not actually sure when to file bankruptcy and what effects the bankruptcy will have on their property and credit reputation. Fortunately, the bankruptcy process is not as “scary” as it sounds, and in the right circumstances, can provide comfort and assurance to those who really need financial assistance. Here, we list five common misunderstandings people have about filing bankruptcy. If you are unsure whether filing bankruptcy is the right choice for the financial remedy you seek, please do not hesitate to speak with an attorney. Bankruptcy is the only way to get rid of credit card debt. Before you settle on filing bankruptcy to relieve your credit card debt, take a hard look at your financials. Bankruptcy should be viewed as a last resort, a remedy for those who have no other way to obtain financial relief. Many times, debt can be overcome with a new budget and dedication to pay off the debt. If you haven’t already, write down everything you spend money on: bills you pay, food you purchase, entertainment expenses, etc. Next, write down all income you will receive this month including wages, social security/disability payments, and money from family or friends. Now, compare. Do you have money left over at the end of the month that may be put towards your debt? Are there any expenses you can reduce or eliminate completely? If I file bankruptcy, I will lose my house, car, or other property. Not exactly. 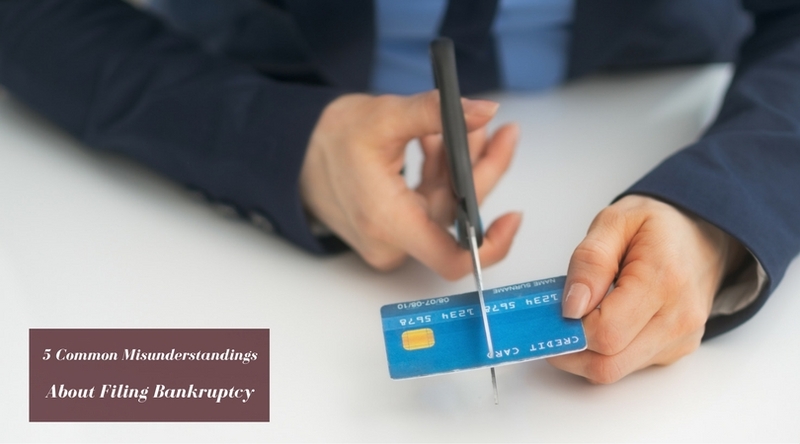 Bankruptcy law is designed to help debtors get on their feet financially. The law provides different avenues to protect the debtor’s right to keep his or her property. The most common protection is the use of the designated exemptions. Federal and state exemptions allow for property used as residential homestead and personal belongings to remain untouched by creditors. It is important to note, that there are limitations to these exemptions. Consulting with an attorney is the best way to find out which exemptions may be right for you. Chapter 7 bankruptcy laws also allows for the reaffirmation of debt, where you as the debtor, will be allowed to keep certain collateral, as long as you continue to make monthly payments. Additionally, filing chapter 13 bankruptcy, also known as reorganization bankruptcy, will allow a debtor to keep possession of property in exchange for repayment of any arrears over a 3-5 year period. If I don’t mention a debt on my bankruptcy forms, I won’t have to pay it. It is best to include all debts when filing bankruptcy. In fact, failure to mention a debt and failure to give a creditor notice of your bankruptcy, may exclude that debt from the effects of a discharge, if granted. That means, though the debts you included on your bankruptcy forms may be discharged, the debt you failed to report will not be discharged, and the creditor will be able to continue collection efforts to collect the debt. When speaking to an attorney regarding filing bankruptcy, it is best to provide your attorney with information regarding ALL the property you own and the debt you have. Your attorney will be able to provide you with the best advice to protect yourself. Filing bankruptcy will ruin my credit score. Yes, your credit score will take a hit after filing bankruptcy. Chances are, if you are considering filing bankruptcy, your score is probably already in pretty bad shape. Once a bankruptcy is reported to the credit bureau, it stays on your credit report for ten (10) years. During this ten (10) year period, though you may be seen as a credit risk, bankruptcy is not an automatic block from all credit opportunities. It is also important to note that credit improves over time by instilling responsible financial habits. I should file bankruptcy without an attorney. The law does allow for you to file bankruptcy “pro-se” without an attorney. However, there are a few things you should consider before making the choice to go it alone. In December of 2015, law was enacted to require the filing of bankruptcy on new forms. These new forms are comprehensive and leave little to no room for errors. Many “pro-se” debtors find themselves completing the forms incorrectly or failing to provide required information without the help of legal counsel. These mistakes may lead to additional costs, or even the possible dismissal of you bankruptcy case without discharge. As well, many debtors believe they will save money by filing “pro se” and not hiring an attorney. However, many debtors are unaware that the rules for filing bankruptcy are complex and making a mistake or incorrectly filing documents can become very costly through the fees for amendments. Hiring a competent bankruptcy attorney can ensure that your documents are filed properly and in accordance to the law. Without help of legal counsel, many debtors fail to file the proper exemptions to protect certain property. This may result in the debtor’s forfeiture of property to the estate. Proper legal counsel can provide guidance through both the state and federal exemptions to protect your property and protect your rights as a debtor. If you are considering filing bankruptcy, please speak with a licensed attorney today to discuss your options to seek the remedy you need.